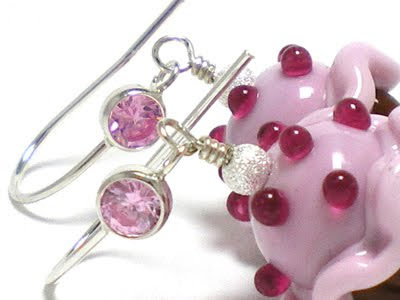 You still have until New Year's Eve (this Thursday) to have a chance to win jewelry in my giveaway! Don't miss out. You can read the details HERE. 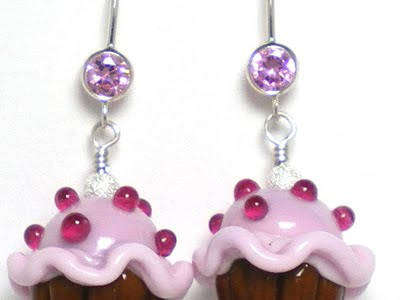 I've "glammed up" my Chocolate Pink Cupcake earrings by adding a sparkly "stardust" bead on top of the cupcake plus ear hooks that feature a stunning pair of pink cubic zirconia crystals. 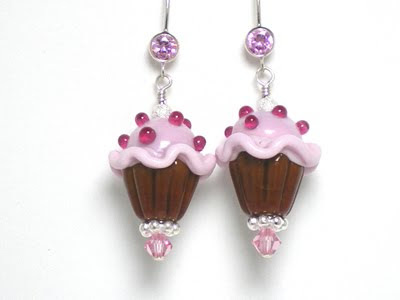 I'm thinking I need to always use these ear hooks because they add such a pretty sparkle to draw others nearer! I just listed a fresh new matching necklace as well, on a 20 inch sterling silver chain, so grab this set as quick as you can as this is the most popular cupcake bead in the shop. I hope your holiday is moving along smoothly on our way to 2010.